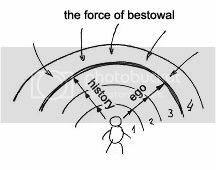 Question: Why does Baal HaSulam write that the transition to bestowal is nothing more than a psychological problem? Then, what is so difficult about this? Dr. Laitman's Answer: The psychological problem consists of beginning to relate everything that happens to you as an intentional external influence. Only afterwards will all the worlds connect together. However, for the time being it poses a psychological problem for us. We need to try to detach slightly from ourselves, as though looking at and evaluating ourselves from the side. (Drunk people sometimes experience a similar sensation of double vision.) We should continuously analyze ourselves and say that everything happening in our heart, mind, and life in general is the Creator who fulfills, controls, and plays with us. "I" is not I, but His game, and I am watching this myself. I have no other choice. I am completely driven by the inner fulfillment, which He gives me. However, He gave me an additional point from which I could look at myself and say, "Everything I think and everything I feel comes from Him." Question (continued): How does one rise above this state? Dr. Laitman's Answer: You need to demand that He change your nature. The Creator gives you special, external circumstances all the time, and you need to ask Him to change the circumstances within you (your properties) and bring them into agreement with the external ones (the Creator's properties). Suppose we enter a place with particular external circumstances which we are unable to stand. Usually in this case, we wish to change the environment to suit us. A "psychological change," however, is understanding that instead of changing the external circumstances, we need to change ourselves to match the external circumstances, since the externality cannot be changed. We can transform ourselves to resemble the new environment, and then we will feel comfortable in it. This is a psychological change, a new approach to the changes that humanity is going through today. Even now, like during all previous times, we wish to change the environment that surrounds us and to arrange the world according to how we understand it. Now however, we have begun a different program, and this world (the Creator who arranges all this) now demands that we ourselves begin to change in the direction of the Creator. New circumstances emerge around me: Darkness comes into the world; everything contracts, becoming more confusing, unclear, and scary. But rather than asking to change the world around me, I need to ask Him to change me. Question: Many people in the world now suffer from depression; they don't leave their homes for months, and require psychological help. What can help them? Dr. Laitman's Answer: Depression is the most common illness in the world today. Only one remedy can be advised for it: the Light that Reforms. No psychologist can help in this regard, because the rampant depression is due to the Creator being revealed to us in the opposite form. Previously, each of us felt as one small person around which the world was revealed in different layers of our egoism: layers 1, 2, and 3. As our ego grew bigger and bigger, we developed in accordance with it by creating a new environment, a world of new technology and social relations. This is how we developed over the course of our entire history, stage by stage, 1 - 2 - 3, toward wealth, honor, and knowledge. Today we have come to the fourth level, which is a special one. At this level, what is being revealed is the Creator, the quality of "bestowal," and not our developing ego, our property of "receiving." This is the fundamental difference of our era, which is the era of revealing the Creator. Previously, nature (the Creator) forced us to develop, that is, to grow and become smarter, more knowledgeable, understanding, and powerful. But now human beings have completed their development at the level of this world. People are recognizing the pointlessness of new discoveries, and everything gradually fades, including the development of science, space research, and so on. We have completely depleted ourselves. Today, in contrast to this, the Creator-a new nature-is revealed. And here we need to proceed in a different manner. We cannot enter a new state with our egoism; we will only harm ourselves. We need to realize that a completely new approach has begun, and neither our strength nor advanced technologies and scientific discoveries can help us. Suddenly we will discover that all the systems we built in this world have stopped working. All the former goals (money, power, knowledge, family, education, and culture) have lost their value. Darkness and despair are appearing in the world, but this is because the Creator, the Force of bestowal, is being revealed in it. We don't want it, since it cancels out our egoism, our nature, and all our desires! It is like a child who runs around wanting to play, and suddenly he is told "That's enough. Now you have to give and love. Go play with your little sister." This is contrary to his nature, and hence his life becomes dark; he immediately loses all his energy. Therefore, we can understand why people are sitting around depressed, unable to leave their homes for months at a time. Antidepressants are the most popular medicine today. However, the only medicine I can advise is the Surrounding Light.